The Regional Forums on the State of the Ugandan Child were follow-up meetings to the National Forum on the State of the Ugandan Child, which was held in October 2015 in Munyonyo, Kampala. These one-day meetings created a shared understanding of the needs of children in adversity, especially girls, and at mobilizing stakeholders on issues of child well-being with in their regional contexts and Uganda as a whole. The main goal of the Regional Forums was to increase regional commitment to improve child well-being in the different sub-regions. In order to fully inform citizens and stakeholders, several regional meetings were planned to disseminate The National Action Plan for Child Well-Being and encourage others to participate in a movement intended to educate, raise awareness and mobilize citizens and government in a call to action. The magnitude of the challenges Ugandan children face requires that every individual, family, community, organization and government entity actively participates to bring about change. A National Action Plan for Child Well-Being has been developed. It aims to create a sustainable and shared vision for the future of the Uganda's children. We seek to consolidate all the action and work plans into this simple comprehensive format to ensure collaboration and partnership towards shared agreed goals using the same indicators to measure our progress. The Action Plan was shared at the Child Forum and participants worked together to identify their roles and responsibilities in ensuring every child is healthy, safe and educated. Objective 3: Strengthen families' capacities to better care for children. Objective 1: Support and provide guidance for parents to help children to learn to express their views in a safe and supportive environment where they feel valued and respected. The National Forum on the State of the Ugandan Child brought together participants, champions and leaders from Ugandan society and other stakeholders from all over the world, committed to improving the lives of Uganda’s children. 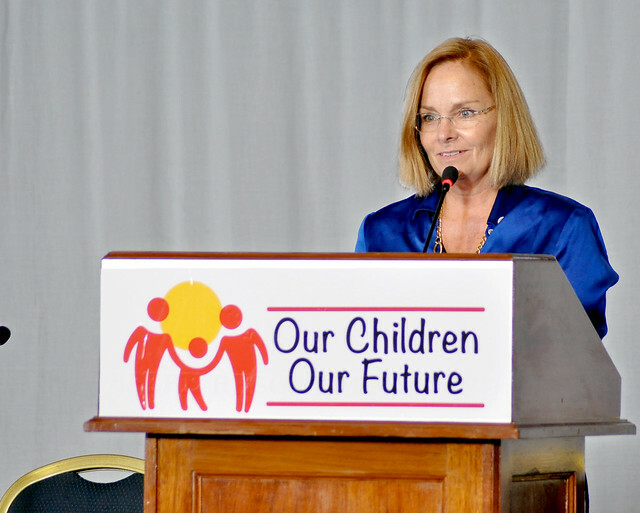 The main goal of the Forum was to increase national commitment to improve child well-being. The three specific objectives of the Forum were: to create a common understanding based on current data of the challenges children face, to advocate for holistic child development reform that supports children better, and to build linkages and networks for actions that change children’s lives. At the Forum, the Framework for a National Action Plan for Child Well-Being, with 20 catalytic national targets, was presented and discussed with participants to gain their endorsement and commitment to a coordinated, multifaceted approach. We understand that it will take a national movement driven by social commitment and political will to bring about change. By the present Declaration, “Ensuring Child Well-Being in Uganda,” key stakeholders involved and knowledgeable in matters of children recognize that this is the time to act, to change current trends, to improve the well-being of all children in Uganda. To achieve this change, Uganda requires a national movement of families, communities, business and government. The National Action Plan Framework will continue to foster a movement for change through further consultations, including several events at the regional level. Signatories recognize that every person has a role to play, and a responsibility to support all facets of child well-being. Every signatory declares and commits to supporting a way forward that is transparent, coordinated, well-informed, and holistic. 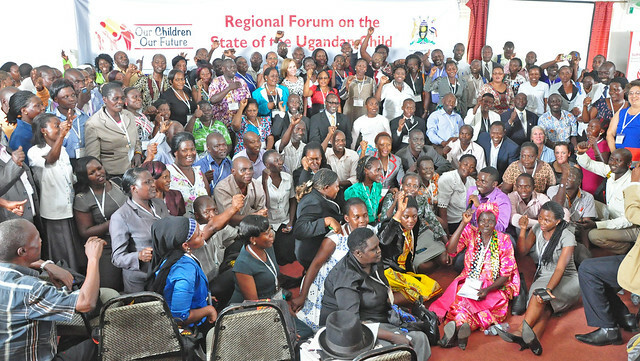 The National Forum on the State of the Ugandan Child was held on 27-28 October 2015 at the Speke Resort Munyonyo, Kampala. The National Forum brought together over 700 stakeholders from all over Uganda and development partners who are involved in improving the lives of children. The theme of the forum was "Our Children, Our Future" with an overall goal to develop energy for a movement for coordinated sustainable vision and increase national commitment to work together to implement evidence based best practices and policies to improve child well-being for the future of Uganda's children. Advocacy: To advocate for holistic child development reform that supports children better. Mobilization: To build linkages and networks for actions that change the lives of children. Common Understanding: To create common understanding based on current data on the challenges children face. The National Forum was a huge success in terms of content, outcomes and full participation of delegates. The Prime Minister opened the Forum with an excellent speech. Over 700 participants came from over 350 different organizations including NGOs, CBOs, Private Sector, Police, Members of Parliament and Government representatives from Office of the Prime Ministry, Ministry of Education, Health, Justice, Local Government and various GOU personnel from the districts. Participants came from over 30 districts in Uganda. There were also regional and international participants including several private foundations. The room was full to capacity on both day one and day two. In terms of content, everyone felt that there was much to learn and there was a lot of good information from international best practices to understanding of Ugandan context and in terms of readiness and commitment to action. The participation of the children in discussion panels reflected/modeled the desired outcomes of the participation goal in the Action Plan. The personal stories of the resilient children brought many to tears and fueled their desire to do something about it. The breakout sessions allowed all participants to fully engage in discussion about their place within the Action Plan and also gave people an opportunity to better understand the framework. People said they were glad to be a part of this historic meeting. Ezra Suruma, the Representative from the President closed the event signing the Munyonyo Declaration. All other delegates also signed the Munyonyo Declaration. Next steps include Regional meetings - starting with Gulu in December, development of the full Action Plan and creation of a one year work plan. Stella Ayo-Odongo is the founder of the Uganda Child Rights NGO Network, a national network of child focused organizations in Uganda. She has over 10 years of experience working in the development field and extensive management experience. Stella understands of the development context at community, national, regional and international levels and has hands on experience as a researcher, community development worker, trainer, legislative and policy advocate, development manager and consultant. Ayo-Odongo has served on the board and management committee of a number of national organizations and has been actively involved in forming, managing and steering coalitions at national level. She has been very instrumental in the formation of the Civil Society Organizations for Peace in Northern Uganda, an advocacy coalition working for a peaceful resolution to the 20-year conflict in Uganda. Ayo-Odongo holds a Master of Science Degree in Development Management from the Open University in the United Kingdom, and Bachelor's Degree in Social Sciences from Makerere University. She also holds a diploma in Development Management from the Open University. Maureen Black, PhD, a pediatric psychologist, is the John A. Scholl MD and Mary Louise Scholl MD Endowed Professor in the Department of Pediatrics and the Department of Epidemiology and Public Health at the University of Maryland, School of Medicine. She is the founder/director of the Growth and Nutrition Clinic, a multidisciplinary clinic that provides services children with poor growth and feeding problems from throughout the state. Dr. Black is also an adjunct professor in the Center for Human Nutrition, Johns Hopkins Bloomberg School of Public Health and the Department of Psychology at the University of Maryland Baltimore County. She is the author of more than 150 publications related to children's health and development. She focuses on nutrition and child development, focusing on both undernutrition (failure-to-thrive) and overweight; and has extensive experience conducting intervention trials designed to examine strategies to promote children's health and development. Dr. Black has been president of two divisions of the American Psychological Association, chair of the Maryland WIC Advisory Committee, chair of the Child Health Foundation, a founding member of the Global Child Development Group, and has served on committees for several professional societies, UNICEF, WHO, and the Institute of Medicine. Dr. Black received a B.A. in mathematics from Pennsylvania State University, an M.A. in occupational therapy from the University of Southern California, and a Ph.D. in psychology from Emory University. She has lived and worked in Bangladesh and Peru with her family. Dr. Susan Cook is the Director of UNICEF's global Office of Research, Innocenti International Research Institute in Florence, Italy. The Office is a dedicated research hub established to support UNICEF's work with children worldwide. A lifelong advocate for communications and outreach, Dr. Cook is the former Director of the United Nations Research Institute for Social Development (UNRISD) in Geneva. Serving in that capacity until June 2015, Dr. Cook is credited with re-introducing a strong, sustainable development component to the Institute's research agenda. Through her research experience and expertise in China, she was able to tilt the Institute's focus toward Asia where her research on China's social and economic transformations included work on labor markets and employment, gender, poverty and inequality and social welfare reforms. Previously a Research Fellow at the Institute of Developmental Studies (IDS) at the University of Sussex, Dr. Cook has been credited with a lasting legacy of successful contributions to research. Her current interests include new directions in social policy being taken by emerging and developing countries in the context of financial, social and environmental crisis. Dr. Cook received her PhD in Public Policy from Harvard University and a Master's Degree in Social Policy in Developing Countries from the London School of Economics. Luis Crouch is Vice President and Chief Technical Officer, International Development Group, at RTI International. He specializes in education policy, decentralized finance (e.g., funding formulas) and decentralization, political economy of reform, education statistics, planning, and projections. He has experience in all key areas of policy analysis, from the generation of primary data, to statistical and econometric analysis, to Cabinet-level policy dialogue. He has previously worked at the World Bank and at the Global Partnership for Education, where he had lead positions. He has worked closely on South Africa's education sector funding reforms and more recently Egypt's decentralization experiments, as well as decentralization and other policy reforms in Peru and Indonesia. In the last few years he has become interested in early grade reading and targeted Early Childhood Development, as the key entry-points to improve education systems' response to the quality imperative. He was one of the lead proponents of this key approach now used by important development agencies and quite a few countries. He is the author of many reports, technical papers including papers in refereed journals, and contributed to various technical books. Nora Fyles is the Head of the United Nations Girls' Education Initiative (UNGEI) Secretariat. Before joining UNGEI Nora worked for the Canadian International Development as Education Team Leader and Senior Education Advisor based at its headquarters in Gatineau since 2003. Nora served as GAC Co-Chair for the past year and headed the GAC's Monitoring and Evaluation Working Group that oversaw the evaluation of UNGEI since 2008. She also heads the GAC Task Team on collaboration between UNGEI and the Global Partnership for Education (GPE) at country level. Prior to her time at CIDA, Nora worked in Belize, Costa Rica, Vietnam, Indonesia, and Pakistan with a focus on education, literacy, skills development and gender for a variety of education institutions, government ministries, NGOs, and multilateral organizations. In Canada, Nora taught children and adult learners with a special focus on literacy and reading, trained tutors, developed and managed community literacy programs, and developed literacy curriculum for NGOs, the Ottawa and Toronto Boards of Education and Ontario Ministry of Education. Nora, a Canadian national, holds a master's degree in International Affairs from the Norman Patterson School of International Affairs, Carleton University, and a MEd from the Ontario Institute for the Studies of Education at the University of Toronto. Dr. Robinah Kyeyune is a Senior Education Specialist and Literacy Advisor with RTI International on the USAID/Uganda School Health and Reading Program. She is responsible for coordinating implementation of the Program's reading component, particularly the development of all instructional materials under the program in consultation with speech communities and lcoal language boards. Dr. Kyeyune's expertise includes providing advice and support to the Program's teacher training and support supervision work. Prior to joining RTI, Dr. Kyeyune was a member of the faculty of the Department of Humanities and Language Education, School of Education at Makerere University in Uganda. She has worked with the Government of Uganda on the review and development of school curriculum and has provided education consultancy services especially in the area of learning improvement and pedagogy. Phiona is a Ugandan chess player. She is not certain when she was born, although FIDE has estimated it to be 1993. She grew up in the Ugandan slum of Katwe, where, as of 2011, fifty percent of teen girls were mothers. When Phiona was about three, her father died of AIDS and shortly afterwards her older sister Juliet died of an unknown cause. When Phiona was about nine and had already dropped out of school because her family could not afford school fees, she joined a chess program run by the Sports Outreach Institute. In 2010, she played six rounds on board two and one round on board one for Uganda at the 39th Chess Olympiad, scoring 1.5 points from the seven. As of 2011, she was a three-time Women's Junior Champion of Uganda. In 2012, Phiona and Ivy Amoko earned Woman Candidate Master (WCM) titles as a result of their performances at the 40th Chess Olympiad, making them the first titled female players in Ugandan chess history. That same year, Phiona became the first female player to win the open category of the National Junior Chess Championship in Uganda. In 2012, a book was published about Phiona titled, "The Queen of Katwe: A Story of Life, Chess, and One Extraordinary Girl's Dream of Becoming a Grandmaster" by Tim Crothers. Disney Pictures has optioned the rights to the book, and feature film is currently under post-production. It is slated for release in early 2016. In September 2013, she took the trophy in the Uganda National Junior Chess Championships. In 2014, Phiona played in the 41st Chess Olympiad on the Ugandan women's team. Phiona is the youngest person ever to win the African chess championship. Dr. Michael Samson is Director of Research at the Economic Policy Research Institute (EPRI), a not-for-profit independent research institute based in Cape Town, South Africa. He is also a Visiting Associate Professor of Economics at the Williams College Center for Development Economics in the United States. Dr. Samson has 25 years' experience working in social protection, and specializes in designing, implementing, monitoring and evaluating social cash transfer programs. He has recently completed policy design projects for social assistance programs in Malawi, Lesotho, Senegal, Ghana, Rwanda and Kenya, and is currently working on social protection projects in Bangladesh, Indonesia, Mozambique, Nepal, the Pacific, South Africa and Uganda. Dr. Samson co-ordinates and co-leads the team implementing the impact assessment of the Child Support Grant in South Africa, and has completed previous evaluations of social grants in South Africa and an impact assessment in Mozambique. In 2009 he organized a workshop in Nairobi, Kenya on open source management information systems for social cash transfer programs. He lectures at policy conferences and training workshops in around the world. Dr. Samson holds a PhD in Economics from Stanford University, California and a BA in Economics from Yale University. Irene Ikomu co-founded and is currently managing Parliament Watch Uganda, a initiative that seeks to create a more transparent, responsive, and accountable democracy by tracking ongoing legislative, budgeting, and other parliamentary processes and disseminating this information to the Ugandan public through various online platforms that include a website www.parliamentwatch.ug and associated facebook page: Parliament Watch Uganda and twitter: @pwatchug. Irene is a youth activist and consultant on governance and democracy with specific interest in youth inclusion. She has been involved in the governance and policy dialogue in Uganda for the last six years; she currently sits on USAID Uganda's Democracy, Rights and Governance Advisory Board, has been recognized as an outstanding young leader by the U.S. Embassy in Kampala and is a Pioneer Open Government Fellow with Code for Africa and Open Knowledge Foundation. She was one of a select group of young Africans awarded the pioneer Mandela Washington Fellowship for civic engagement in 2014. She was also awarded the prestigious Young Female Lawyer of Year 2014 Award by the Uganda Law Society in recognition of her great work and the inspiration she provides to young female lawyers in Uganda. She often presents youth and governance perspectives at policy and governance analysis dialogues, panels and forums including with the African Commission on Human and People's Rights, the Pan African Parliament and the African Union African Governance Architecture as well as on various avenues locally in Uganda. She has been behind diverse social change start-ups that have empowered young people in Uganda to become active citizens like the National Debate Council and the Green Light Movement. Interested in helping us spread the word on the National Forum on the State of the Ugandan Child? Please consider downloading the official social media toolkit here! A brief update on the state of children in Uganda. A reminder that empowering and educating young people, particularly girls, is not only a Western value, but rather it is something valued in Uganda and among people globally. An overview of statistics on and opportunities to support Ugandan children. This video presents the opportunity of girls to create a positive effect on the world. This video depicts the life of a 12-year-old girl and the difference that support systems can make. All girls should have the opportunity to gain the skills, knowledge and confidence to break the cycle of poverty, raise healthier families, and help build their communities. Let Girls Learn is a U.S. government initiative to ensure adolescent girls get the education they deserve. Featuring a comprehensive situation of children's rights in Uganda today, this recent UNICEF Uganda report includes key actions needed to improve children's well-being. This recent publication from UNICEF Uganda provides the situation of children's rights in Uganda today, in numbers. We would like to thank the following organizations who have supported this effort. To share your ideas, add relevant information, or ask questions, please contact KampalaUSAIDChildSummit@usaid.gov. If you are interested in receiving additional information, join the mailing list here. The information provided on this page is not official U.S. government information and does not represent the views or positions of the U.S. Agency for International Development or the U.S. Government.